Download Only The Brave in Digital HD from the iTunes store. 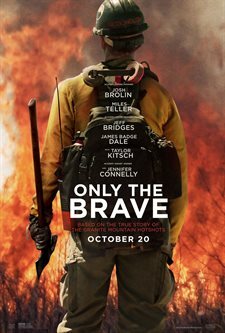 Only The Brave images are © Columbia Pictures. All Rights Reserved. There are people who selflessly put their lives on the line for others all the time and our civil service workers can be counted among this group. Police officers and firefighters put themselves in harms way without much thought to the danger that could befall them. They are unsung heroes who don't get as much credit as they deserve. Among them are the firefighters know as Hot Shots – units of men who fight wildfires, mostly in the western part of the United States. They try to contain the fires so there is minimal damage to forestry and homes while battling blazes in unpredictable conditions. As with hurricanes and tornadoes, wildfires can shift and strengthen based on wind patterns and Barometric pressure and a small fire can suddenly become out of control and deadly. In 2013, one such fire near Yarnell, Arizona took the lives of 19 out of the 20 Granite Mountain Hotshots amounting to the deadliest loss of firefighter lives since 9/11. Only the Brave chronicles the events leading up to that fatal day in June when a brotherhood of brave men lost their lives to a wildfire that quickly grew out of control and left the lone survivor to carry on their legacy. That fatal day left a small Arizona town reeling in disbelief and a country mourning 19 lost souls. Eric Marsh (Josh Brolin; Sicario) is the superintendent of the only municipal Hot Shot training group in the country. For four years, he and his crew trained and put in the hours in an attempt to become a certified crew on the front line. Unfortunately, they were bogged down in red tape and political garbage and their request to be evaluated was pushed off. Finally, they were given their chance and, despite Marsh's outburst, got their certification. Brendan McDonough (Miles Teller; Whiplash) was a recovering dope addict with firefighting and EMT certifications who was looking to turn his life around after becoming a new father. Recognizing a kindred spirit, Marsh gives McDonough a chance to prove himself, just as his crew must prove themselves. After some teasing and tense moments, McDonough is finally accepted as one of the family and it seems things were turning around for all of them. However, as McDonough is the lookout in Yarnell, he sees the wind shifting and finds himself running for his life away from the fire. Picked up by another crew, he listens in horror over the radio as he hears his brothers get trapped by the flames and take cover in hopes to make it out alive. Unfortunately, that was not to be their fate. Brolin plays a role we have seen from him before and while he does it well, it isn't anything new. He is the elder of the group who is smart, cocky, and a little too sure of himself for his own good. Teller, who is not my favorite actor, does a good job of portraying the many emotions McDonough must have gone through from humble addict trying to better himself to proud new father to grieving brother for the family he lost. Jennifer Connelly (A Beautiful Mind) plays Amanda, Eric's wife, and she is great in the role. Strong, independent but clearly in love with her husband, his loss is devastating. Jeff Bridges (The Big Lebowski) plays the fire chief, Duane Steinbrink, who helps Marsh get the evaluation for Hot Shot status and perhaps becomes an almost surrogate father for Marsh. Bridges has played a number of terrific roles lately and this one is no exception. While he is a supporting cast member and his time on screen is limited, his scenes are memorable. The story is interesting in and of itself and is well written but becomes more poignant and compelling when you remember it is based on real-life events. Sufficed to say this one is a real tearjerker of a film and the memories will haunt the viewer for a while afterward as the film stays with you long after you leave the theater. Only the Brave is a beautifully told rendition of events that certainly honor the fallen 19 and others who lost their lives in the line of duty. It's not easy to watch (especially the ending) but it's worthwhile nonetheless. I can only hope it brings some measure of comfort to those family members who were left behind to grieve.